Banbury’s Michaelmas Fair originated as what was called a Hiring fair and it dates back some 600 to 700 years. Farm workers, labourers, domestic servants and some craftsmen would work for their employer for a year at a time, from October to October. At the end of their employment they would attend the Hiring Fair dressed in their Sunday best clothes. The prospective workers would gather in the street or market place, often sporting some sort of badge or tool to denote their speciality; shepherds held a crook or a tuft of wool, cowmen brought wisps of straw, dairymaids carried a milking stool or pail and housemaids held brooms or mops, hence the derivation of the term “Mop Fair”. Potential employers would move amongst them discussing experience and terms and, if they were thought fit, hire them for the coming year. Once agreement was reached the employer would give the employee a small sum of money (the “Hiring Shilling”) and the employee would remove the item signifying their trade and wear bright ribbons to indicate they had been hired. They would then spend the money amongst the stalls set up at the fair which would be selling food and drink and offering games to play. The yearly hiring included board and lodging for single employees for the whole year with wages being paid at the end of the year’s service. These fairs attracted all the other trappings of a fair, and they turned into major feasts in their own right, and attracted poor reputations for the drunkenness and immorality involved. 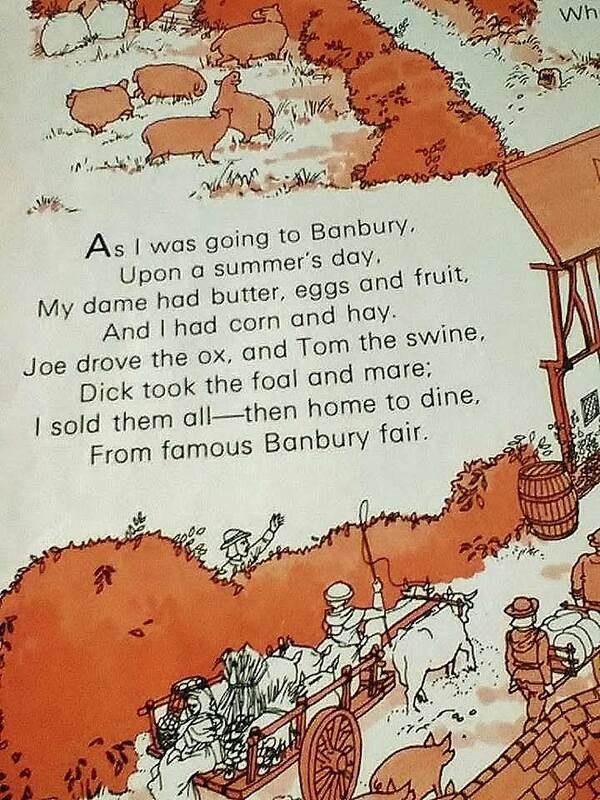 The nursery rhyme/song with which we are all familiar, derives from the hiring fairs. Johnny, on securing employment for the year, had promised to give his sweetheart the ribbons and a few trinkets. To tie up my bonnie brown hair.Oh, dear! What can the matter be? That tie up my bonnie brown hair.Oh, dear! What can the matter be? DURING the 14th and 15th centuries, Banbury became indelibly associated with fairs and markets. The first mention we have of a fair is in a charter of Henry II who granted an annual occasion for Whitsun week. By 1836 there were 13 fairs, several of which were connected with the buying and selling of livestock. Four years earlier 4,600 sheep, 1,220 cows, 300 pigs and 200 horses were brought to a Michaelmas Fair otherwise known as the great hiring fair. The event was the peak of Banbury’s trading and recreational year. Because of its renown, the vast crowds included farmers from the north of England hoping to engage workers and the Army looking for recruits. However most noticeable from the mid-19th century onwards was the growing importance of the pleasure fair. In 1855 some 20,000 visitors (1851 population of Banbury 8,793) descended on the Thursday. Inevitably this produced a dense mass of people who were drawn especially to the front of the town hall where they discovered Sangers Royal Circus and not far away swinging boats, a shooting gallery, peep shows and more than 100 nut stalls. It’s small wonder that the Banbury Guardian of the day claimed “a tolerable picture of our Michaelmas Fair was the usual din of music, hooting, bawling, singing, laughing and firing”. Before leaving the fair most people would have bought a fairing, a souvenir of the occasion. In many cases this was a bag of Banbury Cakes so making the occasion profitable for tradesmen. One Banbury baker spent 10 on currants and could have sold more than 5 worth on the Thursday alone. The fair of 1856 attracted a similar number of people so that ‘”at certain points in the Market Place and Cow Fair (area in front of the town hall] the thronging was terrific”. Up to 3,000 of the visitors had come courtesy of the Great Western Railway. Those who were farmers could take advantage of an above average supply of cattle and horses but employers of labour found fewer potential servants, possibly due to the increasing role of register offices. Pleasure seekers were spoilt for choice with three theatres, a circus and various peep shows but could end up poorer than when they arrived because of the activities of pick pockets. The police thought they had done a good job by driving them under the cover of public houses. However it was not long before six or so empty purses were found at the Great Western railway station. During the 20th century the fair appears not to have happened during the two world wars but to have been revived once hostilities ceased, though crowds were not comparable with those of the 1850s. In 1919 those who did attend found a fair short of its main attractions. The centre of Market Place was occupied by various small amusements rather than the likes of Mr Collins’s roundabouts. However the short walk to the Cow Fair revealed Wilson’s brilliantly lit switchback railway and for fortune telling services there was a veritable army of character readers and palmists. Fourteen years later clairvoyants targeted Banbury because the like of such people had been banned from Giles Fair in Oxford. Overall and since the end of the First World War, the fair had grown substantially in size. In the view of William Wilson, the owner, it was one of the best and only outmatched for scale by Mitcham and Nottingham. Possibly a key reason for this impression was that there were several technical changes evident. Electric lights had replaced the noisy flaring naphtha lamps. In place of the steam organ there were amplified gramophones. Another development was the revival of exhibition booths, which had declined prior to that time. In particular there were displays of unusual human beings and animals. On the eve of the Second World War agreement was reached between Banbury Borough Council and the fair owners whereby shows and stalls could get into town earlier than the usual noon on Wednesday. Despite this opportunity some attractions did not make it to Banbury until evening as they had been at Stratford Mop. New in 1938 was an aeroplane version of the roundabouts and the ‘Waltonian’ whereby patrons manipulated levers over a revolving disk bearing watches and other articles. The object was to isolate items that were then prizes. Boxing booths appeared again after a period of several years absence but wild beast shows once prominent now featured minor animals only. What had disappeared was the likes of Alf Ball’s show that had been displaced by the regular cinema. In 1945 those who went to the fair found that many of the pre-war attractions were still present. As of old the Market Place and Cow Fair offered space for the larger amusements and patrons found the radio cars, dodgems and speedways.